Thirteen years after Gunsmoke was taken off of the air, it returned in a television movie Gunsmoke: Return to Dodge. Kitty has left Dodge City and returned to the city of her youth. What is the city's name? Matt has quit the law and taken what manly occupation? In what part of the body did Dillon get stabbed in Gunsmoke: Return to Dodge? 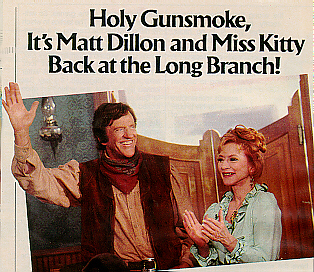 Did Kitty get shot in Gunsmoke: Return to Dodge? What fast food chain was the primary sponsor of the first airing of Gunsmoke: Return to Dodge? (T/F) Gunsmoke: Return to Dodge was shot outside of the United States. (T/F) Arness was twice as old when he starred in Gunsmoke: Return to Dodge than he was in the first television Gunsmoke. Did Dennis Weaver appear as Chester in Gunsmoke: Return to Dodge? No ... Weaver was asked but "other projects came along and I was unavailable". This was probably in reference to his new series Buck James which premiered on ABC one day after the first airing of Gunsmoke: Return to Dodge. 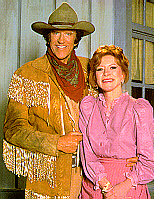 Buck James finished the season number 67 of 82 prime time series and was cancelled. (T/F) William Conrad, who played Matt Dillon on the radio, premiered his new television series immediately after the premier of Gunsmoke: Return to Dodge. True: Jake and the Fat Man premiered at 10:00 on Saturday September 26, 1987 immediately after Gunsmoke: Return to Dodge which began at 8:00. Interestingly, USA Today ran an ad for the evenings programming featuring busts of Arness and Conrad. Jake and the Fat Man finished its first season ranked number 48 of 82 prime series. (T/F) On what network was Gunsmoke: Return to Dodge aired? 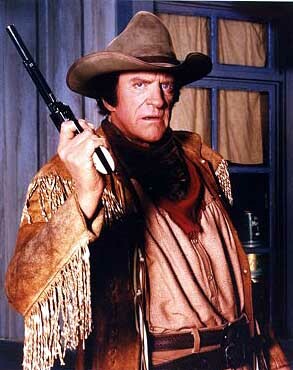 (T/F) The script for Gunsmoke: Return to Dodge was commissioned before Arness was asked to again play the role of Dillon. Ken Curtis who played Festus did not appear in Gunsmoke: Return to Dodge. Why? He wanted too much money - reportedly twice what Amanda Blake was receiving. Answer: ... Mannon played in 1969 and in 1978 by Steve Forrest. Milburn Stone who played Doc did not act in Gunsmoke: Return to Dodge. Why? He was dead. Stone did appear in Gunsmoke: Return to Dodge in flashbacks. 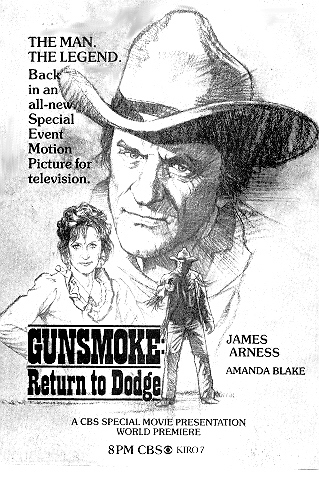 (T/F) To the time of airing, Gunsmoke: Return to Dodge was the most expensive movie ever made for television. In the closing credits, Gunsmoke: Return to Dodge was dedicated to all but one of the following people. Which one was not included? it's alive and well and living in Dodge City". it's just smells that way." Answer: ... Comatose. She also said that ``the pace of the movie is slightly slower than wind erosion" and that "there are more wrinkles here than a Fresno Raisin Festival". Answer: ... A copy of the film was not available to them. Gunsmoke: Return to Dodge, Jake and the Fat Man (with former radio Matt Dillon, William Conrad) and Buck James (with television Gunsmoke's former Chester, Dennis Weaver) all premiered the week of September 21, 1987. The Nielson's rated 68 shows that week. Two of the above shows tied at 27 and the third was ranked number 49 in viewership. Which one ranked 49th? Gunsmoke: Return to Dodge and Buck James tied for 27th while Jake and the Fat Man came in 49th. (T/F) Amanda Blake's initial scene in the Long Branch in Gunsmoke: Return to Dodge did not go well because she choked up over the absence of Milburn Stone. (T/F) Gunsmoke: Return to Dodge was directed and produced by men who were previously not involved with Gunsmoke. False ... The movie was produced by John Mantley and directed by Vincent McEveety who previously directed 35 episodes of Gunsmoke. His brother Bernard McEveety directed 38 episodes. 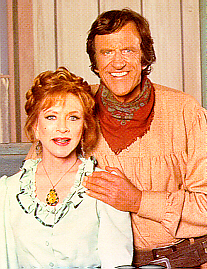 (T/F) Judith Crist in TV Guide named Gunsmoke: Return to Dodge as one of the ten best made-for-television movies of 1987. 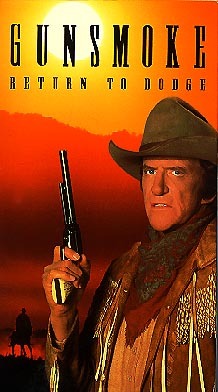 Was the traditional Gunsmoke theme used as the theme of Gunsmoke: Return to Dodge? (T/F) Gunsmoke movies have been released on video cassette.